Julia Black has this unique style of coming straight to the point without being judgemental. 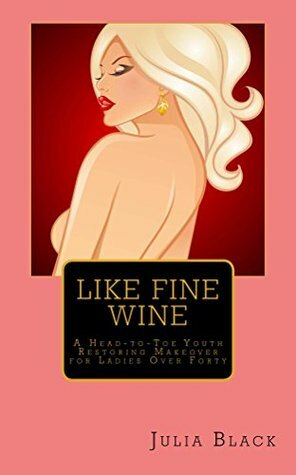 Her book Like Fine Wine is not a beauty book, its a book for beautiful people, the women who are forty. I have heard people say that the older the wine in years, the better is it in taste. Age and experience adds on to the charm of a woman. At forty, she has everything it takes to ensure being the centre of attention. However, she gets so into things during preceding years, that she hardly knows where to begin when she nears or turns forty. Julia's book is the perfect reference. Like Fine Wine, a woman can 're-turn' into the fine woman she always was. The best part is, Julia emphasizes that a woman can look her age and still be ravishing. Her tips and tricks are not just limited to outward charm, they cover inner beauty as well. Hence, her views on attitude, poise etc are worth emulating. The chapters in this book are well-defined and compact. They are not too elaborate, don't force view points, and never compromise on health standards. In fact, they provide all details that are required and in the right amount. P.S- After reading this book I am looking forward to turn forty and be treated Like Fine Wine!! !